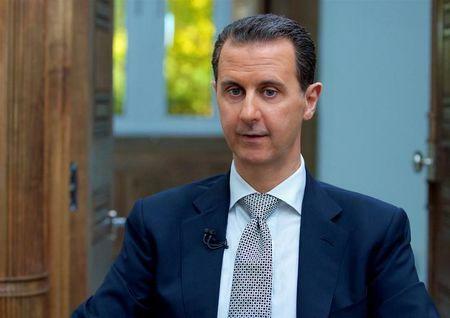 MOSCOW (Reuters) - Syrian President Bashar al-Assad told a group of Russian lawmakers on Sunday that Western missile strikes on his country were an act of aggression. The meeting followed missile strikes by the United States, France and Britain against Syrian government targets over a suspected poison gas attack a week ago. Russia, which is helping Assad fight militants and rebels opposed to his rule, immediately condemned the strikes and called for an emergency meeting of the U.N. Security Council. "From the point of view of the president, this was aggression and we share this position," Russia's TASS news agency quoted lawmaker Sergei Zheleznyak as saying after the meeting with Assad in the Syrian capital Damascus. The president was in a "good mood" and continuing his work in Damascus, agencies cited the lawmakers as saying, and praised the Soviet-era air defense systems Syria used to help to repel the Western attacks. "The tripartite aggression against Syria accompanied a campaign of disinformation," Assad's office quoted him as saying on Sunday. Moscow and Damascus are "waging one battle, not only against terrorism" but also to protect the sovereignty of states, he told the Russian officials. Both countries have dismissed the reports of the alleged gas attack as bogus, accusing Washington of using it as a pretext for the strikes. A senior Russian military official said on Saturday that Syria's air defenses, which mostly consist of systems made in the former Soviet Union, had intercepted 71 of the 105 American, British and French missiles. "Yesterday we saw American aggression. And we were able to repel it with Soviet missiles from the 70s," Russian lawmaker Dmitry Sablin quoted Assad as saying, TASS reported. Sablin also said Assad accepted an invitation to visit the Siberian region of Khanty-Mansi in Russia. It was not clear when the visit would take place. Russia said on Saturday it would consider supplying S-300 surface to-air missile systems to Syria following the Western strikes, but this was not discussed at the meeting with Assad, agencies reported. Assad also declined to comment on calls by the U.S. State Department to declare alleged Syrian stockpiles of chemical weapons, Zheleznyak said.